The XE Future Interface is an interface prototype for XE Medical represents the Radiology technology of the future. 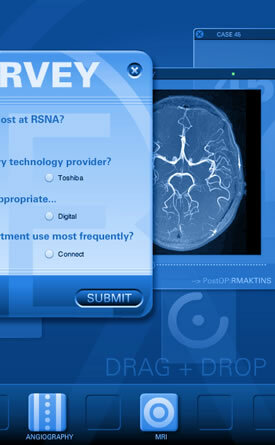 The Adobe® AIR™ program was to be a representation of how the Radiology departments of the future might interact with the medical data as well as the other medical professionals that are involved. The XE Future Interface was built with Flash using Actionscript 3.0 coding, some of which is specific to the Abobe AIR runtime only. One such feature allows the application to store survey answers to a text file on the local computer. The Mouse Idle Monitor Class (by EVOLVE) was used to trigger the survey after a specified time of mouse inactivity. The application activates the data icons when they are dragged & dropped on to the stage. The data icon then opens up and becomes a data window. It returns to the Icon State when closed or dragged & dropped on to the Tray. The active group of data windows morph their size and depth changed when window focus is changed, creating an illusion of depth. Runtime "re-parenting" between the Tray and the Stage occcurs as the data icon changes to a Window State. The content on this page is the intellectual property of Paul Johnson Interactive.